We've recently launched a redesign of a popular forum, and a lot of users are stating that the redesign is now too bright for them to read, which is obviously not good for a forum. We deliberately made sure that we didn't deviate too much from the old site, for instance the white in the background is the same white as the old site, and we made the text darker. We did make the font black, and change it to open sans, but I would have expected this would have improved the experience of the site not dampened it? The only other thing that changed is the blue around the site, which I'm wondering is making the site feel brighter? Are there any tips to make a site feel less bright or improve the legibility? And the one thing I have changed from that screen shot is to stop using pure black and use a softer shade instead. Contrary to the other answers in here, I'd say there's nothing particularly wrong about your site's color choices. 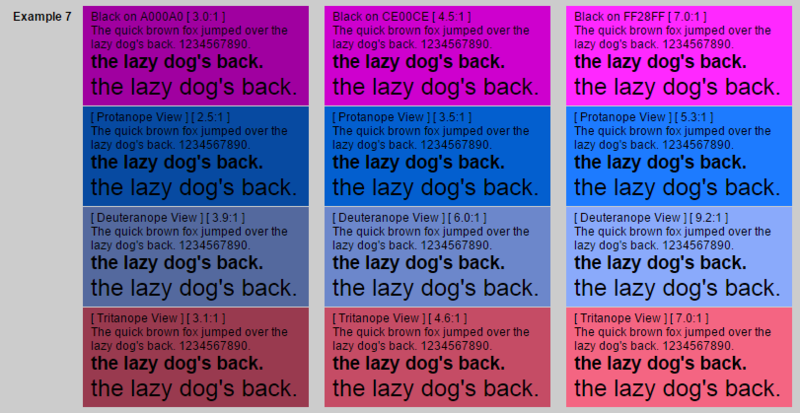 I have a hunch people aren't complaining about the colors on your site. They're complaining that you changed the design of their site. 'Their' site is the key factor here. Any succesful online community will include a large member population that feel that this is 'their' site. And this is justified. And no one likes it when someone comes and changes the design of your site. My guess is that they're more upset about change--not what the change is specifically. In the future, be sure to manage change when you have a large online community. Make sure people are aware of what's coming. Open up beta access. Etc. At this point, compromise. Lighten the text slightly and/or darken the background slightly. Make it feel like their complaints were heard and some change was made in response to them. What causes the issue is staring at a very bright background continuously. This causes the cells at your retina to get tired, which makes reading almost impossible. Avoid using large very bright backgrounds (duh!). Any large surface should be something other than bright white. Variation. The issue is not really caused by something being too bright. (As you said you used the same white.) It is caused by the users only looking at something with a bright background all the time. There should be darker surfaces people look at, so the eyes can rest. Large images, titles with colored backgrounds, sidebars... doesn't really matter what as long as it is something people spend time looking at, so that they do not spend all their time looking at something bright. Optimal for reading might be making the font very large, as that would give your retina lots of variation and proper average brightness, but it isn't really usually practical. You can also give the background subtle low contrast texture. But maybe your complaining users expected something else. Maybe they want the ability to change the UI themself using diffent themes on the site which, if you are signed in, can be managed under a settings menu. There are a lot to chose from when it comes to readability and color schemes. It doesn't have to be black on white. The following is a colorful example (even if I wouldn't chose them) of black text on colorful backgrounds that all passes contast ratio in order to be readable. I think what could be happening is that combined with the change from serif to san-serif and the use of quite a black font on a virtually white background is causing a ghosting contrast problem especially when moving on to sites with quite a light font. Meanwhile, the serif font results overall in less ink on the page because there's thin strokes in the detail and so the 'squint' effect is of a mid to dark grey. 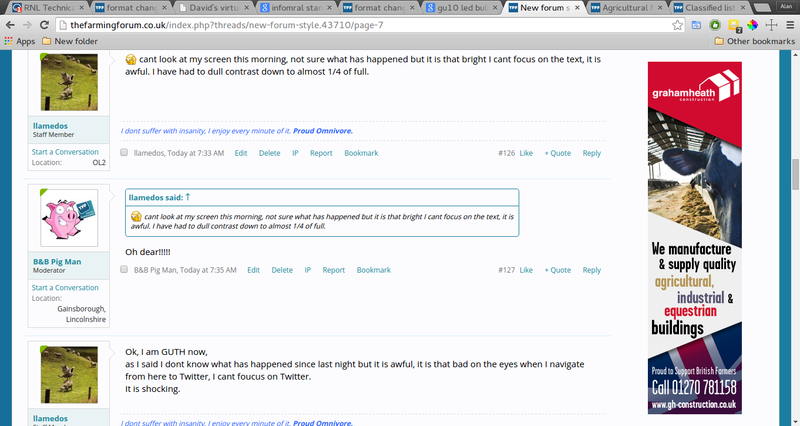 Now - notice that Twitter has a different line spacing to your forum. The result is that many factors are falling into place for there to be a rather nasty interference pattern which takes some time for the eye to adjust to whilst the ghost effect fades away. Depending on where you look, the interference pattern may be reduced or compounded, resulting in a kind of swimming effect making it hard to focus on some areas. Hard to say this is definitely the problem, but there's a good chance this is at least not helping the situation! Not the answer you're looking for? Browse other questions tagged legibility forum background or ask your own question. My forum has many views and Facebook likes but very few users are actually logging in or posting topics/replies? what's the downside of too many forum threads? What are the latest Concepts in Forum/Conversation UX Designs? Should new content be added ABOVE or BELOW the actual content? Should TL;DR be bold or the sentence that accompanies it?